GlucaGen® is a prescription medicine used to treat very low blood sugar (severe hypoglycemia) that can happen in people who have diabetes and use insulin. GlucaGen® contains an injection of glucagon, and works by triggering the liver to release stored sugar, raising blood sugar levels. It is injected under the skin, similar to how insulin is injected. Do not use GlucaGen® if you are allergic to either glucagon or lactose, have a tumor of the adrenal gland called a pheochromocytoma, or have a tumor of the pancreas called insulinoma. aGlucaGen® may be stored up to 24 months at controlled room temperature 68° to 77° prior to reconstitution. Do not freeze. Keep in original package to protect from light. Speak with your health care provider or your diabetes care team about how GlucaGen® HypoKit® can help in the event of a severe hypoglycemic episode. Show family, friends, coworkers, and teachers how to use the kit - just in case. It may be a good idea to ask your doctor for two prescriptions, so you have one GlucaGen® HypoKit® at work and one at home. Check the expiration date. 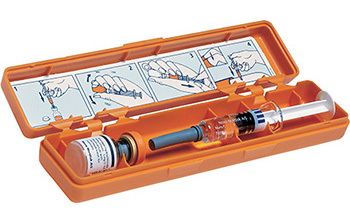 Do not use expired glucagon. Remember, if you are having a severe hypoglycemic episode, you will not be able to treat yourself. You will need help from others around you. Make sure your family, friends, and coworkers know where to find and how to use the GlucaGen® HypoKit®.